Windows 10 version 1709 Error KB4088776 | WeblySpeaking Inc. 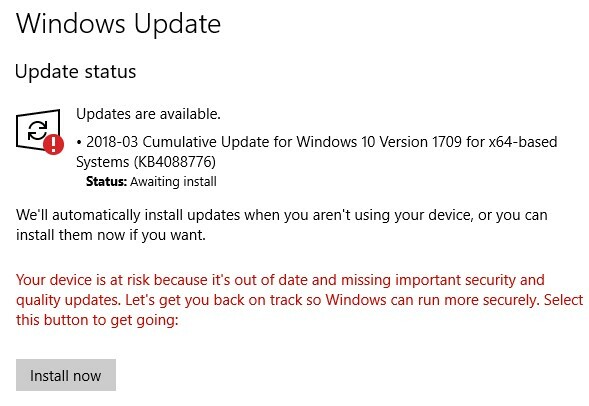 If you are having a problem with error KB4088776 while updating your windows 10. read the following instructions hopefully it will help you as that is how we fixed our system. Hopefully it will save you some time. We had our issue on a Dell Inspiron 24. (microsoft signeture edition ). update is succesfully installed but, windows update displays it as failed. will update this post once we finalize our findings. Symptoms: you may install and restart your system several times but it will fail to finish the update. you can download the windows update repair tool, but it will only delte the exting download. when it tries to install again, it will face the same issues. Subscribe to us, to get update on what we do.